Moses’ mother knew how wrong it would be to destroy her child. But there was little she could do to change Pharaoh’s new law. Her only alternative was to hide the child and later place him in a tiny papyrus basket on the river. God used her courageous act to place her son, the Hebrew of his choice in the house of Pharaoh. Do you sometimes feel surrounded by evil and frustrated by how little you can do about it? When faced with evil, look for ways to act against it. Then Trust God to use your effort, however small it seems, in his war against evil. In another verse we see that Moses’ mother was reunited with her baby. God used her courageous act of saving and hiding her baby to begin his plan to rescue his people from Egypt. God doesn’t need much from us to accomplish his plan for our lives. Focusing on our human predicament may paralyze us because the situation may appear humanely impossible. But concentrating on God and his power will help us see the way out. 2 The woman conceived and bore a son; and when she saw that he was a fine baby, she hid him three months. 3 When she could hide him no longer she got a papyrus basket for him, and plastered it with bitumen and pitch; she put the child in it and placed it among the reeds on the bank of the river. 23 After a long time the king of Egypt died. The Israelites groaned under their slavery, and cried out. Out of the slavery their cry for help rose up to God. 25 God looked upon the Israelites, and God took notice of them. 1 Now a man from the house of Levi went and married a Levite woman. 4 His sister stood at a distance, to see what would happen to him. 5 The daughter of Pharaoh came down to bathe at the river, while her attendants walked beside the river. She saw the basket among the reeds and sent her maid to bring it. 6 When she opened it, she saw the child. He was crying, and she took pity on him. “This must be one of the Hebrews’ children,” she said. 8 Pharaoh’s daughter said to her, “Yes.” So the girl went and called the child’s mother. 9 Pharaoh’s daughter said to her, “Take this child and nurse it for me, and I will give you your wages.” So the woman took the child and nursed it. 11 One day, after Moses had grown up, he went out to his people and saw their forced labor. 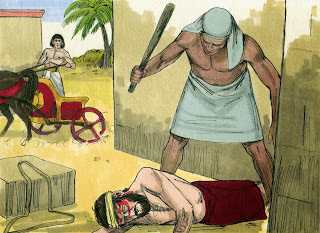 He saw an Egyptian beating a Hebrew, one of his kinsfolk. 15 When Pharaoh heard of it, he sought to kill Moses. But Moses fled from Pharaoh. He settled in the land of Midian, and sat down by a well. 21 Moses agreed to stay with the man, and he gave Moses his daughter Zipporah in marriage. 24 God heard their groaning, and God remembered his covenant with Abraham, Isaac, and Jacob.